We can’t believe WE didn’t come up with this idea! We are all victims of this and now Swatch Buddies have come to the rescue! 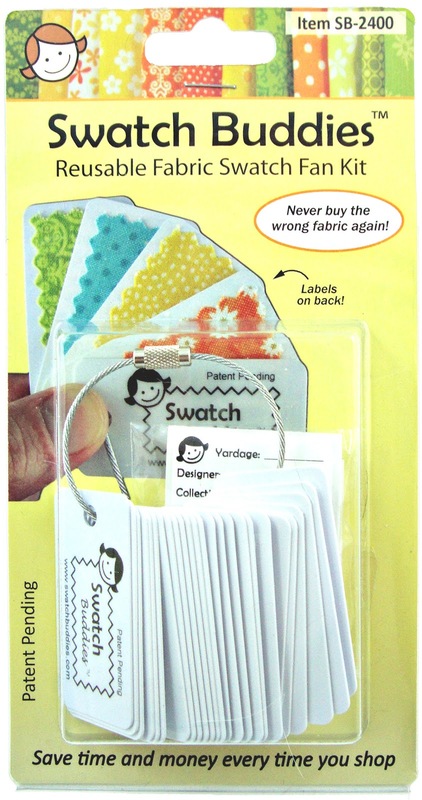 They provide everything you need to make & label your fabric swatches. That way when you go to your quilt shop for that last little bit of fabric, you can show them exactly which one it is. 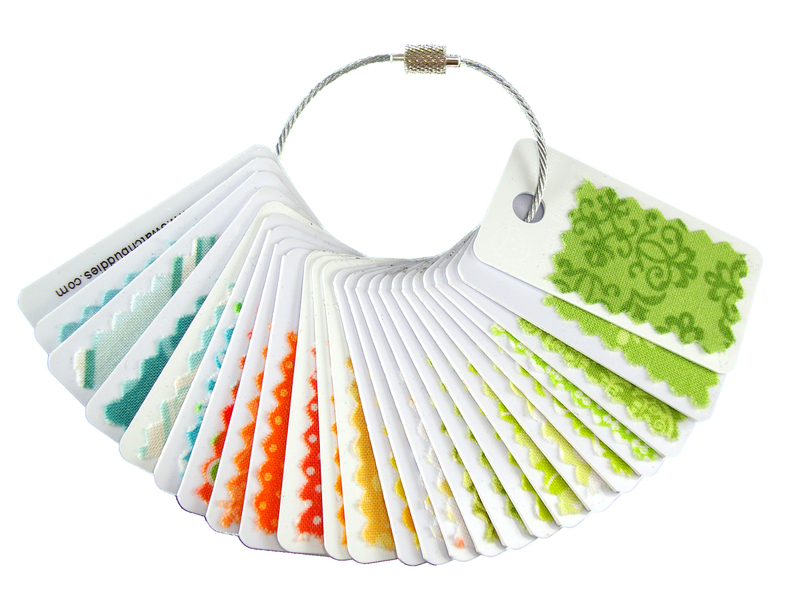 100 count package for the Fabric FANATICS out there (i know there aren’t many of you out there)! They have also come out with a Refill Kit for when you run out of cards. This video shows you how simple Swatch Buddies are to use. We think this would be a splendid stocking stuffer! Great idea, I would definitely like Santa to leave this in my stocking! Thanks for the chance to win. These look interesting. Thanks for having a give away. One of those, why didn’t I think of this ideas! Thanks for chance to win. Great idea! 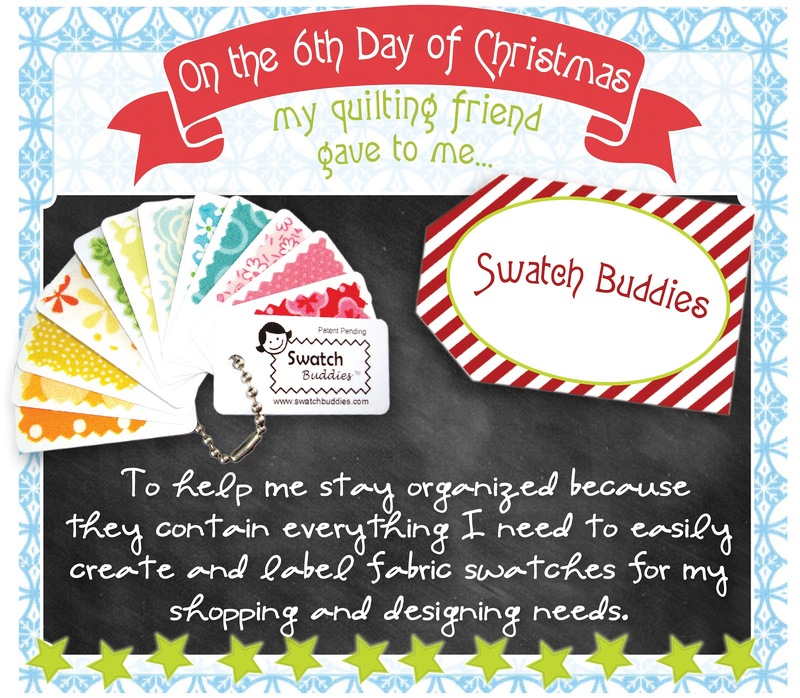 Every quilter needs her buddies, and swatch buddies look wonderful! Buddies and quilting…who could ask for more? Thanks for the opportunity to win swatch buddies! These would be very useful at this house! I am constantly on the look for the perfect fabric to match a project so this would be a wonderful help! Thanks for the chance!! This is a great idea. I never cease to be amazed at how many shades there are of every color, even black! Oh the mistakes I have made. Thanks for the chance to win. This would definitely help organize my stash and my future purchases! Thanks for the giveaway. Having struggled to find a bit more of a fabric recently, I see the value in this tool… maybe Santa will come a bit early to my house!! Boy this IS something I really need if my fabric is at home and I “think ” I know the shade I usually find out I am off when I get the new fabric home. I have been contemplating this purchase for quite some time at my LQS! What a great idea! …and I said the very same thing – “why didn’t I think of that?” Thanks for a chance to win! Oh that is so super cool! I wish I had that when I started quilting! I would have it all in color order and hanging off my purse, you know to decorate it, and make people jealous! I live “way” out in the country. I get to go to fabric shops only occasionally. This little gadget would be wonderfully helpful! Now I wouldn’t get there and not be sure of exactly what I needed! I have on my list of things that need to be done to set up a fabric portfolio and would love to have these to help me along. Thanks. Of course I follow your blog! I am reorganizing my sewing space and this would be the perfect little thing to help me organize all the WIPs I am finding. Pleaseeeeee Santa?? I would tell Santa to leave this in my stocking because I wouldn’t buy so much fabric if I was organized (please don’t tell him the truth that I’d buy MORE since I was organized). Oh Santa…my swatch book is overflowing so this would make swatching a whole lot easier for me! This would be a great way to keep track of what I have! that is a pretty cool idea, it would help me with shopping because i have the worst luck with trying to match fabric, santa would rock if he stuffed that in my empty stocking. Sure beats carrying the precuts with me like I did yesterday. I would love to have this! This is a wonderful idea. It would be a lot nicer than dragging around baggies full of loose swatches! Great idea! I need one of this too! I would love to find a swatch buddy in my stocking. In fact, could he leave several??? One for fabric (quilting)’ one for floss (cross-stitching) and one for paper ( card making/papercrafting). Santa needs to put these in my stocking because I am a mess with swatches. I usually jam them in my pockets and lose them before I get to the store! These are the best things ever.I really could use them because I never know what I need for a quilt I am working on and almost always buy the wrong fabric. Thanks for the giveaway. My memory is horrible and I could really use this! I’m always looking for the “perfect” fabric to finish out a project but I hate lugging all of the other fabrics along to the shop with me. These would solve my problem perfectly! Great idea. I have been stapling swatches to 8 1/2 x 11 paper and it always gets torn up in my purse. This would sold the problem. Thanks for the chance to win. Fingers crossed. Santa is unhappy with my quilting area. It is a mess and I really need some help. He has decided that my Christmas stocking needs a way to stay organized. The answer: The Swatch Buddy, of course. They contain everything I will need to easily create and label fabric swatches. Thank you for giving all of us a chance to win. Only Santa and Moda knows the answer. What a great idea! This would be sew much prettier than the paint samples that I now carry in my purse for matching fabrics! I think that this might come in handy. I’m the worst at matching up my fabrics and this would help a lot. What a fabulous idea! I would love Santa to help keep me organized. This is a great idea. I would love to find one of these in my stocking. I am forever forgetting to bring a swatch to my LQS to match coordinating fabrics. This would help me so much. Fantastic idea! I am forever looking for a piece of this or that to do a project. And some times it is so hard to communicate what you are looking for. Great idea! I’m always dragging all my fabric to the quilt shop. Would love a Swatch Buddy. This would be much easier than trying to match fabric from a picture on my phone. Oh my gosh.. These would come in handy so often for me! I can’t count the number of times I’ve had to try and describe the fabric, or try to pull up a picture on my phone. These would be an absolute Godsend for me to have! How lovely it would be to receive this set in my stocking. No one can be too organized. Love this idea and would love to find some of these in my stocking! Graet idea. This is much neater way to do it than doing it my way, large safty pin with attached swatches. Thanks for all the great giveaways. I would love this. Please put in my stocking. Well, I’m definitely in the category of fabric “fanatic.” This tool looks fun and functional ! Hoping to try it out. Thanks. I would love for santa to leave me this so I don’t forget what I’m supposed to be buying. I’m easily distracted by beautiful fabric. This is GENIUS!! I can’t tell you how many times I’ve gone to the store with scraps shoved in my pocket in order to match new fabric with what I have, or to find the same fabric. This is a great way to organize my stash and to empty my pockets! Thank you so much for the chance to win! Santa, this is an awesome gift because I never have my fabric with me when I need it! Oh Santa would be much loved (not that he isn’t already) if he left those in my stocking! Just what I need! Think my husband would love these as he tries to keep me and my stash organized. Would bring him peace and joy! I would love for Santa to leave this for me. I can’t get to a fabric store very often(really I need to find one that carries lots of cottons) and when I do it would sure help to have a reference for what I need (or want) to help me enlarge my stash. Clever idea! Thanks for the giveaway! What a great idea, count me in! This is seriously the single most wonderful thing ever!!! Where have you been through all of my years of 4-H projects and now redecorating and sewing things for my kids….love this! How neat this is – I want Santa to bring me one so I can gaze at the beauty of the swatches. These are on my list, but if Santa wants to bring them that would be great:) THanks! What a fantastic idea. I have a terrible memory, so this would be so helpful. Shopping for thread, fabric, etc. would be so enjoyable when I could just pull my swatch buddy out to match. Love the idea! How handy would that be. I would like Santa to leave these Swatch Buddies in my stocking because my color memory is compromised by the sight of additional new fabric designs and colors. A couple of my friends have these and love them. I have been a very good girl and these would work better than my current system which is throw cuts of the fabric I want in my wallet which then eventually gets lost by the time I get to the store. What a useful little gadget. I’d love to find one of these in my stocking. What a Brillant/Great Idea. No more finding swatches in my pockets to match. All organized and in one place. Please Santa. What a great idea. I tend to put tiny sample pieces in my bag which then get lost. I am poor on fabrics colors selection. I hope this brilliant tool will help me to do it. Great idea! Anything to help keep my fabric organized and aid my memory is welcome! Thanks for the chance to win! I have so many fabrics that I need other fabrics to go with them to be able to put a quilt together. This would help so much! I would (almost) take something OUT of my stocking to make room for these babies! What a great gift they would make!!! This is a fabulous idea! I used to carry swatches around in a small looseleaf, but that got old. Now I just throw the whole piece into a bag and tote it with me. This doesn’t look any more cumbersome than the store cards on my key ring! What a great idea:) would love to win one! Oh my Goodness these are awesome!!! I would love these to keep me organized!!! These would come in so handy when I’m looking for coordinating fabrics. This would definitely help organize my stash and my future purchases! Thanks for the chance to win!! this is great! it would keep me from carrying big pieces of fabric to the store to match colors or find more yardage. Such a great idea! Way more cute than the piece of paper I usually carry around. Oh I would LOVE this! I’m fairly new to quilting and still finding my organization. 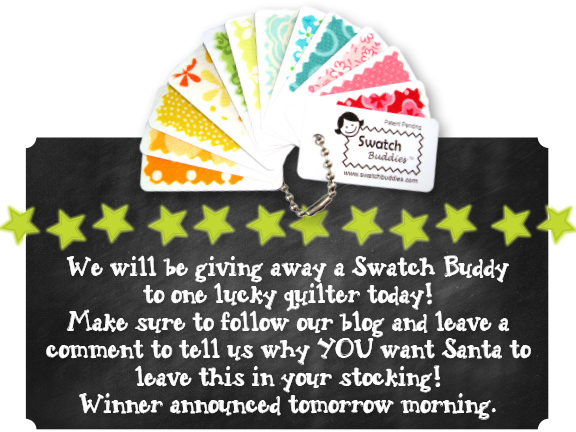 Please leave the SwatchBuddies in my stocking, Santa, because I need to take my beloved fabric EVERYWHERE I go! That way there is NO matching mistake!! Such a great organizing idea! Fantastic idea!!! Thanks for the chance! These would be incredible! So much fun and a great thing to have for my fabric collection! Oh, Santa knows exactly why I need this present in my stocking! I try to keep this info in my head, but it’s getting a little messy in my internal filing cabinet! What a great idea!! I would love this to help me be better organized. Thanks so much for the chance! This is such a great idea, and would help me finish some quilts, because the little swatch I cut gets lost in my purse. I need this from Santa! So definitely one of those “Duh, why didn’t I think of that” moments! So cool . . .AND convenient! I think I need one for each of my UFO projects. Thanks for sharing! I have been trying to be more organized about bringing my fabric swatches to a quilt store when I go. However, I usually just glue them to index cards, and they get easily lost in my purse. I’d love to try this new notion. Great idea! I tend to do a good job carrying color in my head if I can get it fixed there. This would be a surer thing. I would love love a swatch buddy. I need something to carry my stash so I can easily match when I am out and about. What a smart idea–I think I need a set of these! Oh Santa, would love a set of swatch buddies! Don’t you think they are better than making a list? Oh wow!!! What a very cool idea!!! I’d love to win one for my dear, sweet mother-in-law (or keep it and order her one). Thank you! What a great idea! Using that I wouldnt buy the same fabric more than once. 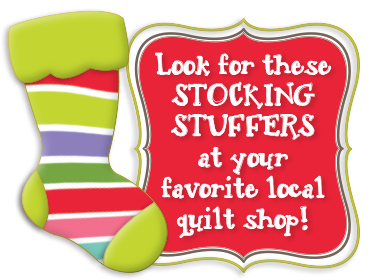 I’d love to have this in my Christmas sock…looks like a good way to keep fabric organized so you buy the right matches. Thanks for putting my name in the hat. This would also be great for when you make the occasional mistake and have to run back to the quilt shop to pickup some more. So Santa…..I need one. Thank you Santa. That’s a great gift! Oh Santa! Please bring me this gift and help me gain control of my stash! Swatch buddies would lighten my load when working on a specific project. I am collecting polka dots and sometimes forget what I have. Oh WOW!!!! now that I know about this I can’t possibly do without it! I just simply must get one or three. I would love it if Santa put one in my stocking! Christmas Stocking is empty!) Thanks for the chance to win! 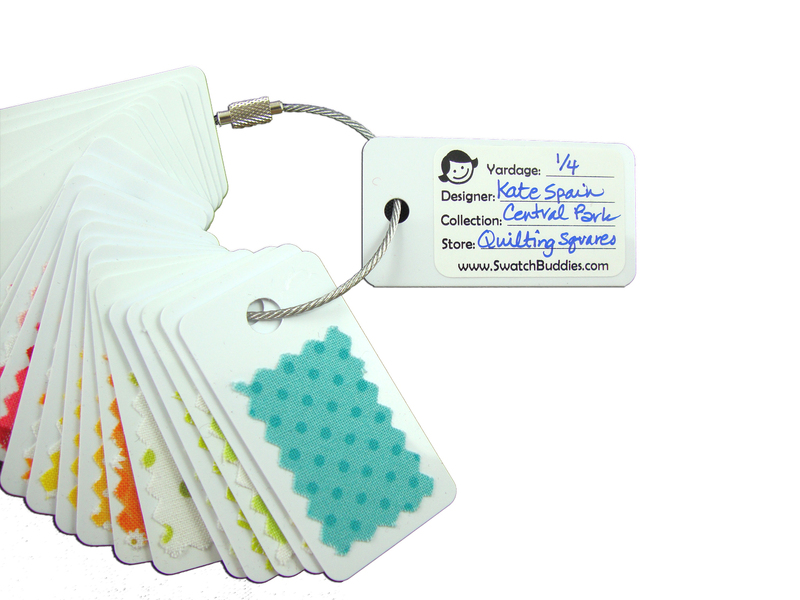 these little stash tags look like a great way to keep your sanity when your shopping for a particular fabric line or trying to match colors. Oooh! Would love to have this! I am always “sure” I can remeber the color I need for a project, only to buy fabric, bring it home and find out it is one or two shades off. This would be wonderful to have! 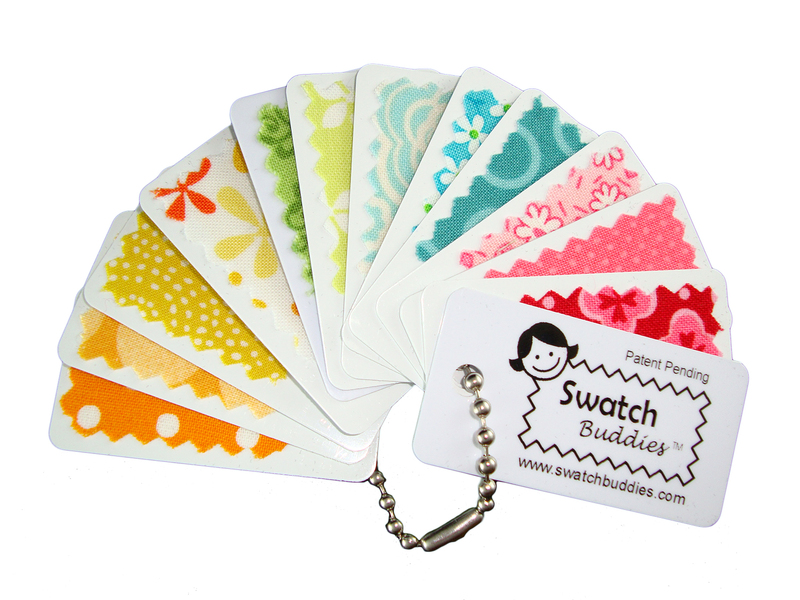 I’ve been very good and would love to have a set of Swatch Buddies. I really like to be organized and think they would help me. I am a collector of tricky sewing gadgets and this one is such a clever idea. It would be fun to win a prize for Christmas. Love this! Thanks for a chance to try it out. Because I always end up going to the fabric store without the fabric and end up with something the wrong shade ! I need a swatch buddy because… then I would have no excuse left for not having a current record of my ongoing fabric projects in my purse. How clever! Love it. I always have several projects going at once. How perfect is this?! I really need one. I’ve been good Santa. : ) And thank you for the great opportunity to win this!